I love the appearance of old typewriter letters, with e’s that look like o’s and the type lighter or darker based on the person’s finger strength or the age of the ribbon. These days of crisp print generated by high quality (yet disposable) printers has reduced some of the character we used to get from typewriters. Ah well. This recipe does have a bit of the cook’s character in addition to the purple ink and jumpy alignment, read on to find it. 2 c cake flour (sifted before measuring), 1 c sugar, 1/2 c Crisco, 1 teas salt, 1 teas cinnamon, 1/2 teas cloves, 1/4 teas nutmeg, 1/4 teas allspice, 1/4 teas soda, 1/2 c milk, 1/4 c molasses. 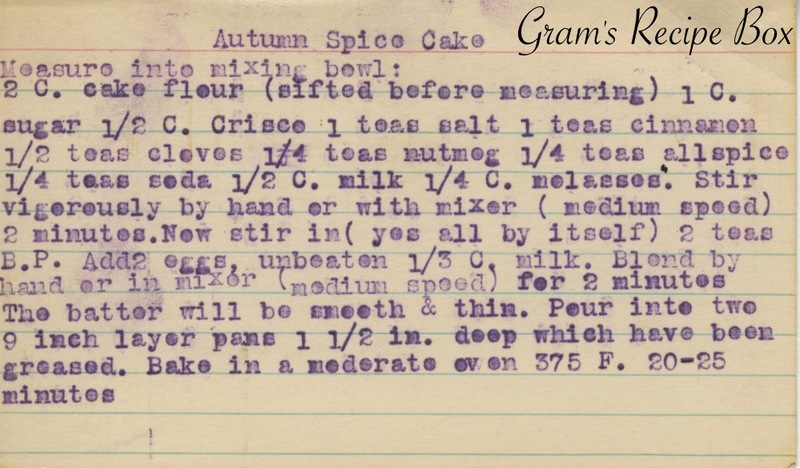 Stir vigorously by hand or with mixer (medium speed) 2 minutes. Now stir in (yes all by itself) 2 teas B. P. Add 2 eggs, unbeaten, 1/3 c milk. Blend by hand or in mixer (medium speed) for 2 minutes. The batter will be smooth & thin. Pour into two 9 inch layer pans 1 1/2 in. deep which have been greased. Bake in a moderate oven 375 F. 20-25 minutes.